Flag2Tag is the very latest form of outdoor advertising. It's based on the familiar shop-front flag, but always visible, even when there is no wind. Flag2Tag is all about being seen. Ideal if you want to win over shoppers. The rotating mechanism shows both sides of your advertising board. You can quickly and easily swap the board for a new one with a new advertising message, thus ensuring your outdoor advertising is always up to date. 360-degree exposure - the first flag with two visible sides. Small investment, high returns. Constantly attracts the attention of passing shoppers. The highly durable flag is based on the familiar shop-front flag, but has a contemporary look. Respond quickly to new themes and seasons. Simply order a new board. Fixing the Flag2Tag to the facade is very easy! Flag2Tag is a complete pack including board, flagpole, and mounting set. Suitable for facades, stalls, and even boats. Upload your own design during the ordering process. You will receive the Flag2Tag set with your own design within ten working days. You can install the flag on the facade in just five minutes. Prepare for more attention and more footfall! 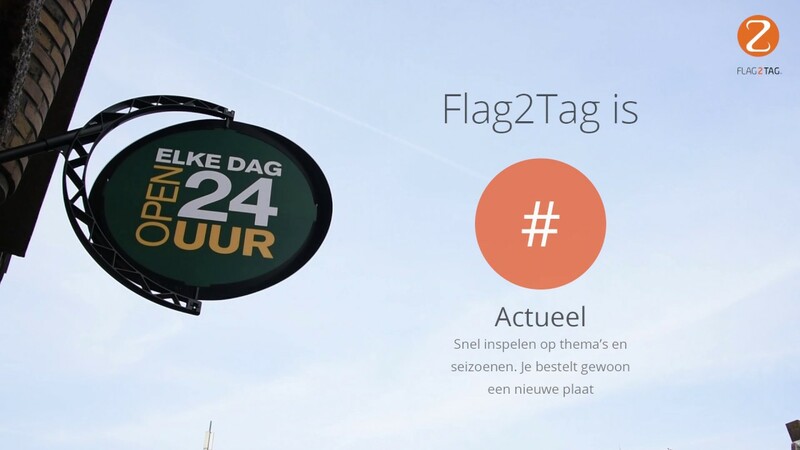 Flag2Tag helps me to generate more attention value. It immediately led to more shop visits and new customers. It was the best way for us to promote our homes – it was easy to install and provided instant results. The order process is so quick and easy – there's a flag in your basket in no time! It's a fantastic eye-catcher for your company.